Today, February 5th, is National Wear Red Day! Everyday women are dying at the rate of almost one per minute. Speak up. Make a difference. Show your support for the fight against heart disease in women by wearing red today. 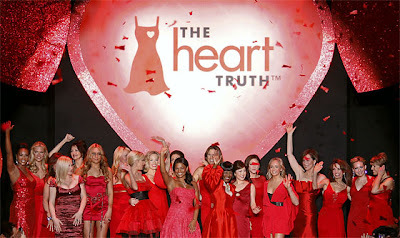 Heart disease is the #1 killer in America and most women don't realize that it is preventable! Wear red to work, to the mall and to the party you're attending tonight! You can also encourage the men in your life to help spread awareness by wearing a red tie. Heart disease can be triggered at any age so it is important to visit your doctor even if you're young. To learn how to live a proactive lifestyle or for more information on the Go Red For Women campaign, please visit http://www.goredforwomen.org/. Stay healthy and become aware: GO RED! This past October, we met Maria Celeste, Host of "Al Rojo Vivo," during the Red Dress Fashion Show in Miami. Maria is a big supporter of Go Red For Women and she was truly inspiring that night. Help make a difference and wear red today.